Press and hold the “*” key. Press and release the right arrow button until the display says “System Configuration Menu”. Press and release the “OK” button. Display should say “Hardware failure status: Clear. Press OK to clear”. Press and release the “OK” Button. Message changes to “Hardware failure status Cleared. Press Cancel to continue”. Press and release the “CANCEL” button as many times as necessary, so that, either the “Welcome to Photosmart Express” screen appears, or, the “Ink System Failure” screen appears. Not print at this stage. Using the Power Button, turn the unit OFF and unplug the power cable from back of the printer and wall. Turn the unit on. 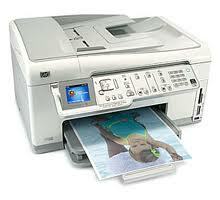 The printer may display message “Use the power button to shutdown the printer" followed by “Press OK to continue”. Press OK. The Printer will start the “One time ink initialization process”. Allow this process to complete and do not interrupt. Press Setup menu on the All-in-One then scroll using the arrow key and select Print Report then select Self Test Report. Unplug the power from behind the printer. Hold down the “print photo” and “cancel” at the same time. You should be able to see it with a blank screen for several seconds. Try again and again if at first it doesnt work. Unplug the all-in-one from power. Plug in the power only. Repeat steps 2-4 two more times. On the third time after plugging the unit into power check the functionality. Unplug the power cord from the back of the HP All-in-One. Wait for the unit to go to the sleep mode. Wait for 60 seconds. Press and hold Print Photos & Photo Fix buttons simultaneously on the control panel; keep them pressed and reconnect the power cord to the All-in-One. Continue pressing the buttons until the display goes blank or Reset shows on the control panel display. I was able to perform the reset on a C6280 by disconnecting the power, leaving it for about 60 seconds, then pressing and holding Print Photos and Red Eye Removal while reconnecting the power. I continued to press and hold both buttons until the screen went black and the power light went off. However, this did not resolve the error. 28oequopeSolution 2 worked for me also. Many thanks, I have now printed these solutions and put them in my printer file. Thank you for cure options. I have a C7280 that ran empty on black ink. I replaced the cartridge and got the Ink System Failure 0xc05d1281 error with the new cartridge installed... ink gauge read full. Tried all the options multitudes of time with long wait periods. I exchanged the black cartridge for a new one and repeated the option 4 procedure using the Photo Fix (Red Eye) & Print Photo buttons. Then tried the Print Photo & Cancel buttons... that finally worked and ink got loaded. Tells me that the cartridge may be the problem with ink flow. Solution 2 worked for me. I was about to throw it out and buy another printer. I was very annoyed as it had only done 2500 pages according to the log. I have bought hp products for many years but the quality is poor compared to previous and the back up now non existent. Thanks so much, solution 2 worked for me! Solution one worked for me, but not directly after clearing the error, but after launching a test page from the support menu (nozzle test). Solution 2 worked for my HP Photosmart D7460. Thanks a lot!!! HP Center was unable to help me repair. OMG!!! Are you kidding me?? #2 worked....you have no idea how long I have been resetting and repowering my HP7280...and this works 1st try! !